Fig. 1. 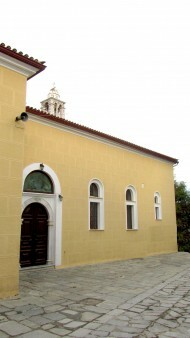 The church of Panaghia Limnia in Skiathos. As the visitor climbs the cobbled street which begins from the old quay of Skiathos and reaches its highest point, he/she find themselves in front of the church of the Birth of the Virgin Mary, the church of Panaghia Limnia which points upwards to the sky with its bell tower and oversees the Limniots’ neighbourhood. According to one version, the Limniot quarter was formed around 1790 by fifty families from the Euboean town of Limne, ancient Elymnion, who abandoned their homes and settled on the south side of the island of Skiathos, on the rock known today as Saint Yannakis. Since that time this quarter was named Limnia or Lymnia after its inhabitants. This had been the location of the old town of Skiathos, possibly in the Middle Ages and had been found in ruins by the Limniots when settling there. The people of Skiathos had abandoned it in fear of the pirates either in the 14th c. or early 15th c. and had made their home to the north of the island on a rock named the Castle after its Venetian fortress (possibly, however, built by the locals themselves). At the start of the 1821 revolution, the Limniots who had settled in Limnia, also sought refuge in the Castle, returning again in 1829 with the people of Skiathos when things had calmed down and went on to re-establish what is today’s town of Skiathos on the south east side of the island. According to another version, some inhabitants of Limnos colonized the island at an unknown date, bringing with them the ancient icon of Panaghia Limnia. The Church of Panaghia, situated in the centre of the Limniots’ quarter, was built in 1829, when the people of the island returned there, in the place of the small parish church of Saint Charalambos which no longer fulfilled the locals’ religious needs. In 1836, by an act of the City Council of Skiathos, the church was dedicated to the Birth of the Virgin Mary and celebrates on September 8th, like the church by the same name in the Euboean town of Limne. 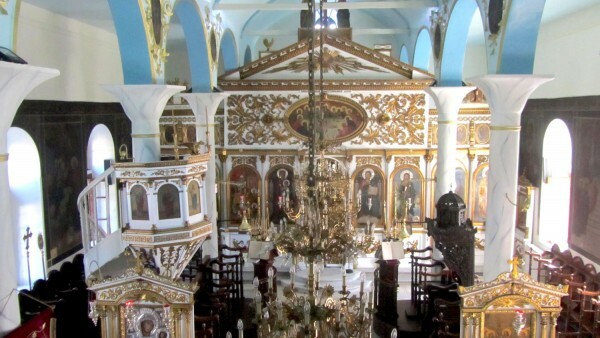 The church is a basilica with three naves, a type used, because of its large capacity, in mainland Greece and the islands during the 18th and 19th century, mainly for parish churches. The exterior does not prepare the visitor for what he/she will encounter inside. The moment one crosses the threshold of the church’s south (main) entrance one is mesmerized by the two three dimensional iconostases and the elegant carved wooden pulpit, as well as being captured a few steps further by the templon which is also carved. The church was constructed in the era classicism was predominant and aimed to rise to another level with the prevalence of sculptured forms that had stood the test of time. From the Renaissance and almost down to our times, the same basic forms such as columns, pilasters, cornices, entablatures, and decorative elements are being used, copied from the ruins of the Classical era. The templon in the church of Panaghia Limnia is an example of a revival of an ancient Ionic temple. Its height equals almost that of the church itself. It stands on a marble base consisting of two rounded steps, set quite back in the solea, that lead to the Royal Doors (Ωραία Πύλη, or Beautiful Gates). The section corresponding to the central nave protrudes more than those corresponding to the ones on either side. The first horizontal zone of the templon is made up of six panels (θωράκια), three on the left nave and three on the right. 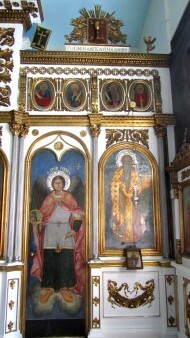 Two sanctuary doors are placed between the first and second panel of the left nave as well as between the second and third of the right, on which the Archangel Michael, Commander of the Celestial Forces and the Archangel Gabriel are depicted respectively. The panels are divided by small square columns standing on a three part base (a rectangular section, a wavelet and a third smaller, also rectangular, section) that continues all the length of the bottom section of the first of the templon’s five zones. Α thin, embossed and gilded frame is enclosed by three cherubim that decorate the facade of each column. Each panel is adorned with a very realistically rendered garland of flowers. On the ends of each garland hang two nodes (one on each end of the panel) from which starts a ribbon with engraved decoration, its ends undulating above and below the garland. The entire decoration is enclosed in an embossed frame made up of three zones, the central one being gilded. 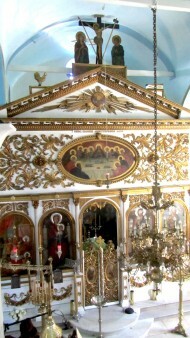 The place of the lower vine (κεταμπές) is taken up by a combination of gilded wavelets on which a bronze rod is attached, playing the part of the iconostasis. 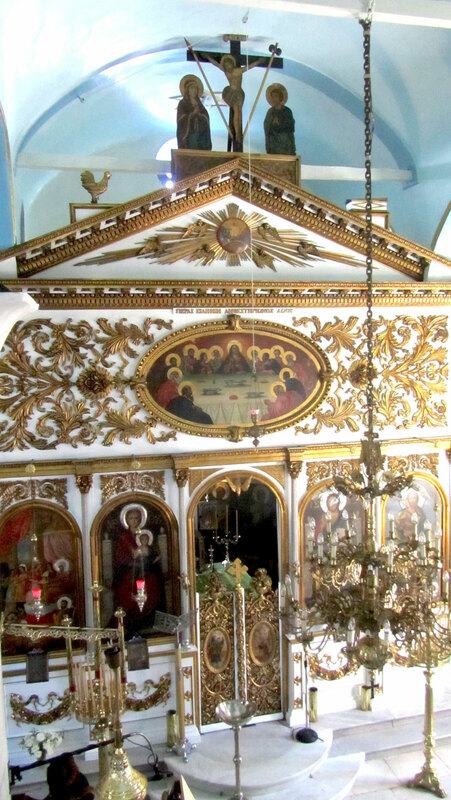 The zone of despotic icons: the icons are divided by thin Ionic columns with Corinthian capitals and are enclosed in arched and gilded frames also in three parts. 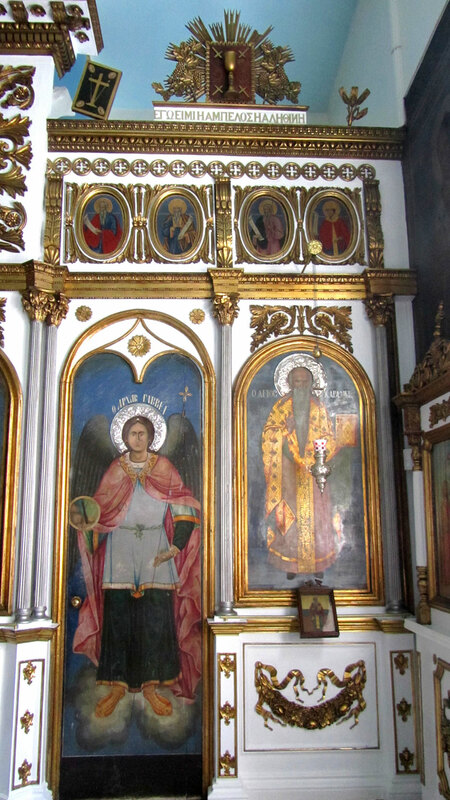 On the left, the first to be depicted is Saint Nicholas facing the front, with white hair, a beard and halo. He is wearing a green felonio, a stole and mantle in shades of red and gold. He raises his right hand in a blessing and holds the Gospel in his left. 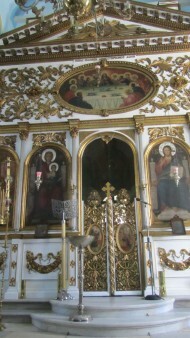 There is a portable icon of Saint Nicholas on the iconostasis dating, like all the others, from 1875. The zone is interrupted by the sanctuary door of the niche of Intention (Προσκομιδή).This is followed by the birth of the Virgin Mary, a composition with many figures. In the foreground are Joachim wearing a halo and seated on a throne, a servant holding the Holy Infant which also wears a halo and a bit further back another servant who is obviously helping bathe the Infant Virgin Mary Saint Anne is in the background half reclining, being looked after by five maid servants. The colours of the composition are vivid. Perhaps this was a way the artist wished to convey the joy of this particular birth. 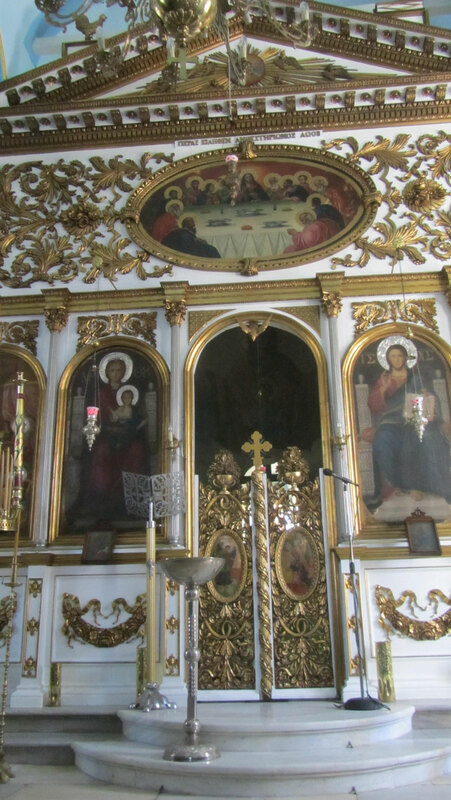 On the iconostasis there is a portable icon with the same subject matter. The next icon is that of the Virgin Mary, belonging to the type known as the “Hodigitria” (She who shows the way). The enthroned Virgin with the Child in her arms is depicted facing the front. They both wear silver halos, the Virgin is dressed in a dark green robeand dark red veil with gold trimmings and the Infant Christ wears a spotless white tunic belted at the waist and a dark green mantle, while he raises his right hand in blessing and holds a rolled up scroll in his left. The Virgin Mary Hodigitria is also on the iconostasis. The Royal Doors come next, immediately followed by Christ Enthroned, facing front, wearing a silver halo, his hair loose and a goatee in the Syrian style. He wears a red tunic with gold trimmings, with only the top part covering his right arm and shoulder being visible, as well as a small section covering his right ankle and foot. All the rest of his body is covered in a dark green robe. He blesses the world with his right hand and holds an open Gospel in his left. John the Baptist is depicted next, his hair loose and wearing a silver halo. He is clad in a sheep’s hide in shades of brown and green. He holds a cross in his right hand in a gesture of benediction and an open scroll. On the bottom right, his head is depicted on a plate. Saint Charalambos appears, next to the right hand sanctuary door, with white hair, halo and a long wedge shaped beard. His right hand is raised in blessing, while his left holds a Gospel He wears a purple sticharion, patella, stole and golden mantle. The Royal Doors consist of two panels that, when closed, are joined together in the centre by a slender, ribbed column, decorated with a winding acanthus shoot and crowned by a clover shaped Βyzantine cross sprouting from a bud like base, that in turn stands on a smaller bell shaper one. In the centre of the two panels the Annunciation of the Virgin Mary is depicted in a composition of acanthus leaves, spirals and roses all starting from the centre. In two ellipsoid convex panels, the Archangel Gabriel annunciating is depicted on the left and the Virgin Mary on the right. On their upper section the panels are crowned by two vases with handles and floral decoration. They belong to the type of deep cup/fruit bowl with roses, daisies and acanthus leaves depicted realistically. Blind drums, situated between the icons and thecornice, bear Baroque decorations,while two smalljoined arches decorated with daisies make up the lintels of both the Intention door and that of the Deacon. In place of the curtain (velum) is Christ as High Priest. His hair is loose, he has a goatee and gold halo in a blue green light, while his right hand is raised in blessing and he holds the Holy Chalice. The Holy Ghost is suspended above his head in the form of a Dove. Higher up, the architrave includes two successive zones separated by a cord and astragalus molding and a third decorated with a stylized plant motif, both running across the templon from one end to the other. The arrangement of the templon in the central nave is different from that of the naves on either side. Thus, after the architrave (in place of the frieze of the ancient temple) we have a broad band with Baroque ornamentation in the central nave. In the middle of this band the Last Supper is depicted in an ellipsoid medallion among tendrils of plants and leafy shoots. Christ can be distinguished in the centre, wearing a halo, talking to his disciples with his right hand raised. The disciples look in different directions with rather frightened expressions. The artist probably chose the moment Christ announced that one of his disciples was going to betray him. 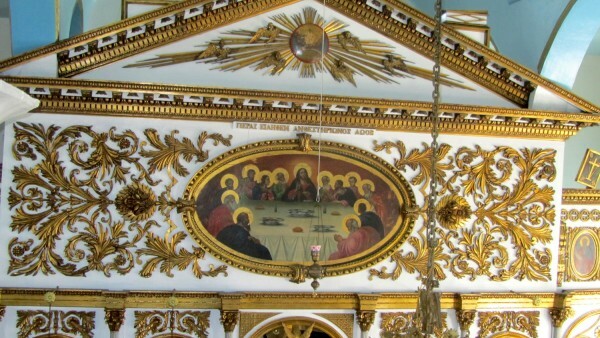 Exactly above the Last Supper, is the inscription in capital letters: ΠΕΡΑΣ ΕΙΛΗΦΕΝ ΑΝΘΕΣΤΗΡΙΩΝΟΣ ΑΩΟΒ (1872). (COMPLETED IN THE ANTHESTERION MONTH OF 1872 [i.e. the eight month of the attic year, corresponding to February on our calendar]). Next is a band in three parts (a Baroque version of the wavelet), followed immediately by a pediment in the spirit of classicism of the period. The limits of the pediment’s sides are set by a wavelet similar to that of the previous band, while the sides visible from the main church and the women’s gallery are decorated with flowers,in sections formed by the acanthus leaves which imitate marble corbels. The Ancient of Days surrounded by cherubim is depicted in rays of light, in a circular medallion, on the drum of the pediment. The Crucifixion is at the top of the pediment, on a separate base, the spear and sponge placed across one another and the cockerel of Peter’s triple betrayal and Christ’s open tomb arranged on the pediment’s two ends as antefixes. A) Left hand nave (door of Intention): Directly after the band depicting the despotic festivals and the architrave, which are both a continuation of this central nave, there is a band with two panels defined by rosettes that imitate marble corbels, a pair in each panel, flanked by stylized floral decorations, and depictions of Prophets in oval medallions. Crosses are depicted higher up, inside small circles. The three part band is again present and even higher up in the centre, on a separate base bearing the inscription ΣΚΗΝΗ Η ΛΕΓΟΜΕΝΗ ΑΓΙΑ ΤΩΝ ΑΓΙΩΝ (THE SCENE CALLED THE HOLY OF HOLIES), the Ark of the Covenant is depicted in rays of light. Old Testament symbols can be distinguished on the edges, left and right, such as Aaron’s staff, Noah’s Ark, The trumpets of Jericho, the menorah and the basket. B) Right hand nave (Deacon’s door). Exactly the same arrangement with that of the left nave is to be found here, with the following difference: In the centre on a separate base bearing the inscription: ΕΓΩ ΕΙΜΙ Η ΑΜΠΕΛΟΣ Η ΑΛΗΘΙΝΗ (I AM THE TRUE VINE), in a rectangular frame dressed in dark red velvet is the Holy Chalice, while the Cross is depicted on the left, with the spear and sponge placed across each other and an ear of corn on the right. The inscription bears the words of the Saviour: “I am the true vine” (John, chapter 15, 1) and it also refers to the vine and the cluster of grapes growing in the Promised Land: ….the vine and the cluster of grapes that the sons of Israel cut from the ravine (chapter 13, 24). In our effort to interpret the symbolic pictures of the two side naves, those from both the Old and New Testament, we could say that in the New Testament texts there is an evolution of the revelation. The Old Testament is a preparation for the New; the Promised Land where old Israel goes being an image of the Church of the New Testament. Therefore, in the Old Testament, the confession of a true God and the absence of His image is one of the essential conditions for the people to enter the Promised Land and dwell there. When, therefore, the pictures of the two side naves are seen in this light, it may be estimated that the left hand nave with its Old Testament preparatory depictions makes the believer ready for his/her entrance into the Promised Land, which in this case is the right hand nave with its New Testament pictures that are a realization of those preparatory ones on the left hand side. Σταμέλος Δημήτρης , Νεοελληνική Λαϊκή Τέχνη, Gutenberg, Athens 1993. Φλωράκης Αλέκος Ε., Μαρμάρινα λαϊκά τέμπλα της Τήνου, Εταιρεία Τηνιακών μελετών, Athens 1996. Χρήστου Χρύσανθος / Μυρτώ Κουμβακάλη-Αναστασιάδη, Νεοελληνική Γλυπτική (1800-1940), Έκδοση Εμπορικής Τραπέζης της Ελλάδος, Athens1982.